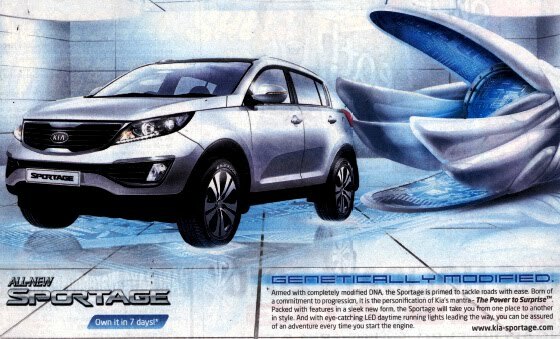 An eagle-eyed client was surprised to see the words "Genetically Modified" featured prominently in this automobile ad in Singapore last week! We're more used to seeing marketing based on the absence of genetic modification (GM), with the words "non-GM" or "GMO-free" featured on packages of organic food. It's presented as something to be avoided, even if the labels don't explain why. In contrast, this ad promotes the genetic modification of its product! Like the negative labels, it also neglects to explain why you should want to buy a car 'armed with completely modified DNA'. Perhaps it is somehow connected to a 'commitment to progression' that the customer shares with KIA. Along with many others working in agriculture technology, I've always preferred the term 'biotechnology' because it sounds less frightening and mechanical than genetic modification. But I find myself using the term GM more and more often now. Perhaps the fact that the term shows up in car ad is a sign that others are finding it less frightening-sounding as well. Which would indeed be a progression!